We’ve arrived on the East Coast, but so has Hurricane Joaquin. Luckily the really windy bit is camped out over the Bahamas, but it is still managing to scoop up a lot of water and dump it on the Eastern States. It hasn’t stopped raining for three whole days! We picked up our “small” motorhome, or RV as they call them – only 25ft long and about 6 tonnes! The rental company features giant posters of National Parks on its vehicles and we’d dreaded getting one with Mt Rushmore on the side, but happily we’ve got El Cap. It’s about as manoeuvrable and probably less aerodynamic! The individual States this side are tiny – we already crossed Pennsylvania, Delaware, Maryland, DC and Virginia, stopping only for a brief gawp over Obama’s back fence. We’re now in the Blue Ridge Mountains in Shenandoah National Park and trundling along Skyline Drive. Who knows, if the cloud lifts we might spot a lonesome pine. Otherwise it’s foot to the floor into West Virginia and away from Joacim. ← 30th Anniversary Celebrations – What better than a few routes at Hobby? Your Beel looks rather splendid. 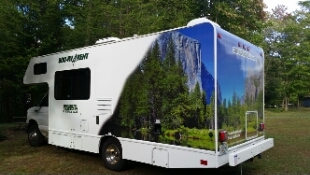 Ha ha, El Cap on the RV – that is hilarious! Did they give you a choice of vehicles from the lot and you chose this one deliberately or is it pure coincidence?